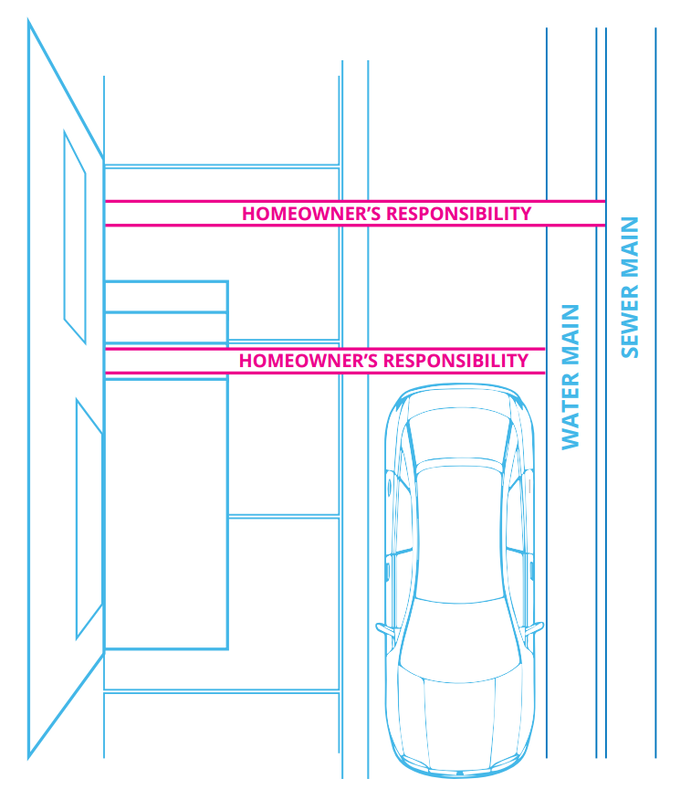 In Harrisburg, like most communities, the homeowner is responsible for the water and sewer lines that run from their house to where they connect to the main including curb boxes, curb stops, valve boxes, and other parts and add-ons associated with service lines. Homeowners must maintain and make repairs to these lines when there is an issue. Capital Region Water is responsible for the water and sewer mains that connect all service lines to our central facilities. Capital Region Water does not endorse, provide, or maintain a list of water and sewer service line warranties or insurance. Warranties are much like insurance. For a monthly fee, companies offer to cover certain qualified repairs for service lines. Service lines are part of a property’s private plumbing system and are the responsibility of the property owner to maintain and repair. Capital Region Water is responsible for the water and sewer mains that service lines connect to. Like with any insurance or warranty program, individuals should explore their options and do their own due diligence to learn what is covered and what exceptions may apply so as to make the best decision for their situation. Blockages in the sewer system can lead to costly sewage backups in your home. Learn how to prevent sewer backups here. Most water and sewer service lines in Harrisburg have never been replaced and can be 100 to 150 years old. It’s the homeowner’s responsibility to inspect their line and make sure that the lines are functioning properly. Inspection and proper maintenance can prevent raw sewage from backing up into your home or the formation of sinkholes and other damage to the surrounding area. Work with a licensed plumber to inspect the lines. They can visually inspect sewer lines with a video camera. A party line is a private sewer or water line shared by two or more properties. Repairs, and payment for the repairs, on party lines must be worked out between homeowners. If problems arise on party lines, homeowners can connect directly to a main if feasible. New home buyers can call Capital Region Water at 888-510-0606 for information about a property’s sewer connection. Learn about paying bills here and your rates here. Capital Region Water is a municipal authority under the PA Municipal Authorities Act. Board of Director meetings open to the public and are held on the 3rd Wednesday of November and December. You can find agendas, meeting minutes, and staff reports here. We welcome the public to attend our meetings and provide input.